Back in 1997, video games had transitioned to the third dimension. The emergence of the Sony Playstation and the Nintendo 64 ushered in new ways to play video games, and many deemed 2D game designs to be obsolete. Despite this drastic shift, there was one classic gaming series that remained defiant, Castlevania. While the likes of Super Mario 64 showed what the new dimension of gaming was capable of, Castlevania proved that there was not only still a place for 2D games, but they could even stand tall against their 3D competitors. Castlevania accomplished this with the remarkable Symphony of the Night. Symphony of the Night was as much a reinvention of the Castlevania series as Super Mario 64 was to Nintendo’s flagship franchise. Though that reinvention may not be as immediately obvious, as Mario made 3D gaming seem effortless, while Symphony of the Night instead showcased how much depth could be weaved into a seemingly old formula. 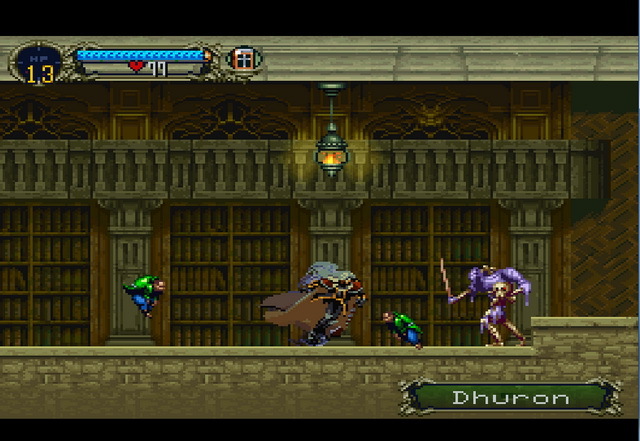 Symphony of the Night literally begins where Rondo of Blood ended. 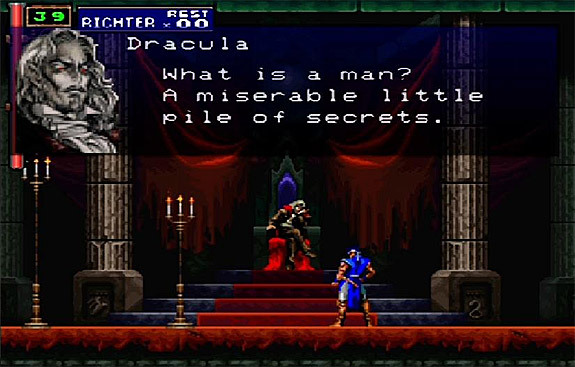 The game’s very first moment is the final boss from the previous game, with players taking on Count Dracula as Richter Belmont (complete with one of the most gloriously cheesy dialogue exchanges in gaming history). The game then fast-forwards four years later, and Richter Belmont has gone missing. Alucard, the son of Count Dracula himself, travels to Castlevania in hopes of discovering Richter’s fate, and to destroy the castle for good. Maria, another character from Rondo of Blood, is also searching the castle for Richter. To both Alucard and Maria’s surprise, the castle is more alive than ever, with Dracula’s armies of monsters ready to stop Alucard’s quest. The plot is simple enough, but considerably more character driven than the Castlevanias that preceded it. Making Alucard the main character gives the game a unique sense of urgency, seeing as defeating Dracula means he must defeat his own father. And while the voice acting is cheesy, it gives the game a kind of campy charm. 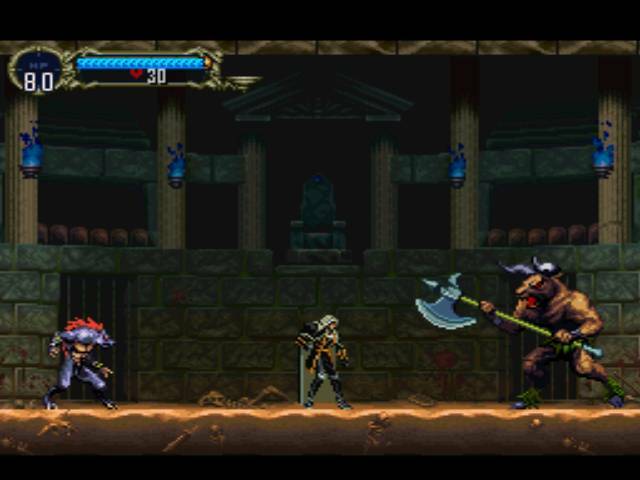 Where Symphony of the Night transcends all previous accomplishments of the series, however, is the game design itself. Symphony heavily borrows the foundations of Nintendo’s Super Metroid, setting all of the game’s events within one labyrinthian game world, emphasizing exploration and character progression in a way that wouldn’t be possible in a traditional Castlevania title. Super Metroid laid the groundwork, but I might argue that Symphony of the Night perfected it. Alucard is a more versatile character than Samus Aran, able to equip weapons and items in both hands, as well as armor, helmets, capes, and rings for defense. He can learn magic spells that are used with Street Fighter-like button combinations, and can gain experience points and level up like an RPG character. Alucard can learn to transform into various forms, summon familars to aid him in battle, and can learn new moves as the game progresses. Similar to past Castlevanias, he can pick up secondary weapons like throwing axes, holy water, and crucifixes, which are used with the hearts you pick up. As is the norm for the series, Alucard can only hold one of these secondary items at a time, but his main weapons and moves are so versatile, you probably won’t care. The best part is, despite the sheer variety in gameplay, it all works so smoothly. Aside from the aforementioned combos used to cast spells, most of Alucard’s actions are mapped to specific buttons. 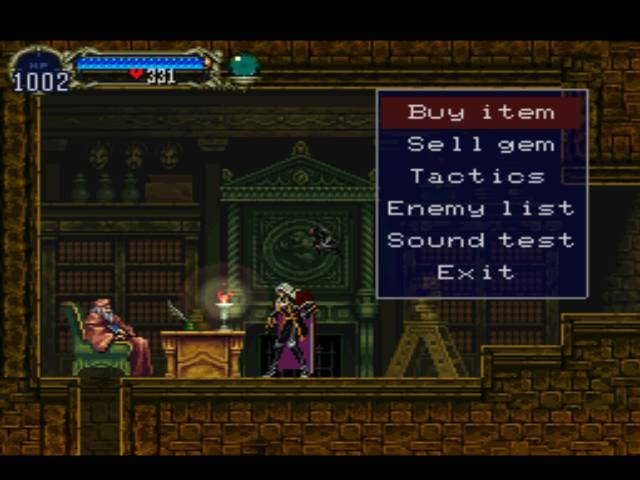 Both of Alucard’s equipped weapons, his jumps, his transformations, almost everything is as simple as hitting a single button (though you must hold up and hit the attack button to use the secondary items, as is series tradition). Not only is it all easy and accessible, but Alucard is one of the best controlling characters in gaming. He lacks the stiffness that plagued the Belmonts of Castlevanias past, and his fluidity of control ranks alongside the likes of Super Mario at the very peak of gaming. Like Super Metroid, Alucard’s progressively expanding array of abilities help him access new areas of the castle and discover its secrets. It is possible to beat the game without seeing everything, but Symphony of the Night is a game that begs to be explored, and the player is rewarded for uncovering as much of the castle as they can. Uncovering the many layers of the castle and improving Alucard’s abilities give the game an insane amount of depth. As stated, Alucard controls so well that its a joy just to move around, and combat, though simple, is immensely fun, with a large rogues gallery of extravagant boss fights serving as a great exclamation point to the gameplay. Visually speaking, Symphony of the Night still looks beautiful. The dark, gothic character designs and grim atmosphere give the game an appropriate tone, while the fluid animations for every character and enemy (specifically those of Alucard himself) are wonderfully detailed. Then there’s the soundtrack, which is one of the finest of any video game. The majority of the soundtrack is performed with a full orchestra, and the game has an incredibly unique blend of classic, electronic, and metal themes. It’s a beautiful, creepy soundtrack that builds on the game’s dark atmosphere. There’s not a single forgettable track to be found. Simply put, Castlevania: Symphony of the Night is one of those exceedingly rare games where all the pieces just come together to near perfection. The gameplay is terrific, the structure and design are genius, the visuals are beautiful, the soundtrack even more so, and it remains a deep experience even by today’s standards. But perhaps the greatest testament to Symphony’s brilliance is the way you can double the length of the adventure if you uncover the right secrets. The twist in which the game doubles its quest is still mind-blowing in execution, and has yet to be topped by any game. Super Metroid may have planted the seeds, but Symphony of the Night is the game that helped them grow. With its release, the ‘Metroidvania’ genre came to full fruition, and it could easily be argued that Symphony of the Night is still the peak of the genre. It’s one of the greatest video games of all time, and that’s no miserable little pile of secrets. I have not yet written a review for Super Metroid, but I plan to in not too long (I hope). It’s a very easy game to love. I think Symphony of the Night is one of those games I played too late. By the time I had finally gotten around to experiencing this game in its entirety, I had already played Metroid Prime 3 and the first Dark Souls, which I feel are the best Metroidvanias out there. That said, I did very much enjoy this game, and I think it has held up better with time than many of its contemporary 3D titles in terms of both graphics and level design. I’m going to have to keep an eye on Mr. Igarashi’s new project; I think it has a lot of potential. Truth be told, I played Symphony of the Night for the first time in 2012! But for me, it didn’t matter, it was pure magic. It’s true that some games have built on what it started, but none of the Metroidvanias I’ve played have grabbed me quite like it. It’s one of the few games where I honestly can’t even think of any nitpicks I have with it. That’s how you can tell a game is truly a masterpiece – not if you think it’s brilliant seconds after its release, but years after its release. That’s what got me interested in Dark Souls; when people were talking about it in 2013, the sheer hype it had is the kind typically reserved for whatever big-name fresh release happens to be out at the time. I dunno if you played it too late. It might just not be for you. I feel like it’s a game that got ignored upon release since everyone was all about polygon graphics when it first came out, but it has picked up acclaim over the years since then. Igarashi made five Castlevania games like it after the fact, but he couldn’t top his original in spite of various technological advances (although I still want to play his new game Bloodstained). Previous Previous post: The Force Awakens Delivers! Next Next post: 100 Video Game Reviews!